As a scientist, and author with an adventure problem I have a fascination with nature and the world out there and I’ve been able to make it my life and work (‘The Marathon Man’, Kanu Magazine). I am always happy that I found a ‘way’ very early, and that I'm not exposed to the pressures of today's social darwinistic society. As an Enfant terrible, I could enjoy many years abroad and on expeditions into a world and nature, which will never be like this again today, and without having to constantly think of my pension, which will never be enough anyway. The unconditional will of survival outdoors and in the so-called 'civilization': and don't forget! You can buy all e-books at Amazon.com etc. where you can enjoy a short excerpt and what's more important: a buyer's comment/critique. A 1,200-mile-paddling-expedition, full of surprises around the deepest lake of the world (1 mile!)! Not everyone dares to realize a life off the beaten track in an increasingly uncertain world and to actually fulfill ones dreams. Henschel is one who has been practicing this for tens of years without fear – ‘well almost, to know what exists beyond the horizon before the Grim Reaper comes,' as he says himself. He is able to implement his minimalist plans into great and brilliant adventures. In this special case: 62 days alone in a kayak on the eastern Siberian Lake Baikal. This deepest lake in the world (1,642 m) is located north of Mongolia with a coastline of 2,000 kilometers and is not necessarily a safe area due to its inhabitants and wildlife. Henschel tells of it – self-critical, honest, ironic and awesome to his environment. Once started, reading this book fascinates, it wakes you longing to realize your own dreams and see this fascinating part of the earth with your own eyes. An honest and self-critical narrative report about a 1,500 mile self-sufficient paddling expedition to the arctic circle, which is not only interesting for paddlers. The original idea of the kayaking expedition was to do the entire Baltic Sea and live solely off the fat of the land like a ‘budding Viking’ – a pure minimalist Thoreau life. He dubbed the project ‘Shin-ken Sho-bu' as a nod to his first year in Japan: ‘Doing things with deadly seriousness', which, as it turned out, couldn’t have been more apt: halfway through the trip, a cross-eyed motorboat captain ended up crushing him against the wall in a Swedish lock. The resulting bone splinters and cervical spine syndrome kept him side-lined for a year before he could eventually resume the expedition. Detlev had to rethink his original plan. After all, dreams meet reality out at sea and there is an adventure lurking around every corner! 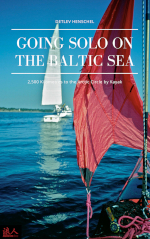 Loneliness, hunger, self-doubt and the monotony of paddling were his constant companions on the ninety-one-day voyage, not to mention the pain of sitting for hours on end, the torments of the unpredictable Baltic Sea, the icy Northern European weather and his frequent lack of energy, even for the cozy nightly campfire. Especially in our fast-moving, jaded times, Detlev’s ironic, self-critical and frank account and the descriptions of his bare-knuckle experiences make for a riveting read – not only for paddlers but also anyone who is fed up with life and the daily grind, still has dreams and might like to see them materialize one day. Africa, a land where adventures are born. Safari owner and tour guide (Doc) Henschel is planning a trekking expedition on the Brandberg, Namibia, Africa with his friend and absolute outdoor newbie Stefan ‘BeeTwo' as well as two Damara Bushmen friends Collin ‘!Uiseb' and 'Jonny B Good'. The isolated and 600 square kilometers and 2500 meters high Brandberg massif is located in the middle of the oldest desert in the world (80 million years), the Namib. This safari through little-used off-road tracks to the 'mountain' and beyond is spiced up by stories of the past 12 years Namibia. Henschel introduces the reader to another world where usual stereotypes and perceptions are inapplicable. In Namibia, many tribes live with their own cultures and languages, including the 'whites' who, of course, see themselves as Africans. Namibia is desert land, but with 6,000 different plant species it has three times more than Germany and one third of the USA. In addition, Namibia has the entire spectrum of African game, which ‘runs around freely there', everywhere! Namibia has ancient deserts, sparse Savannah and dense jungles. It is a land where adventures are born. This reading has nothing in common with a soft-washed 5-star-African-farm-holiday far from the all-day African reality! 58 colored pictures are integrated in the text as well as descriptions of the mentioned animals. "For foodies and outdoor fanatics"
Where, when and how to collect and use them. 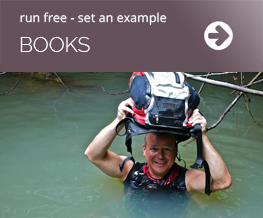 600 recipes for gastronomists (foodies) and connoisseurs (outdoor fanatics). 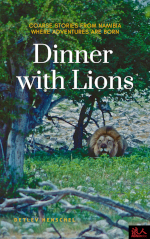 The second book by scientist and adventurer Dr. Detlev Henschel is about edible wild plants, which might just save your life if you get into trouble – hence the subtitle: Eat or Die! 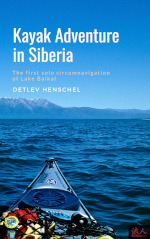 Henschel's first bestseller was inspired by his 2,500-kilometre (1,500-mile) solo kayak expedition on the Baltic Sea to the Arctic Circle, where he had to make do with what he could find along the way. In the wake of the decline in quality veggies etc. 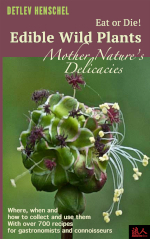 self-picked wild plants have become popular for everyday salads or even as delicacies from nature among nature lovers, hikers, foodies and outdoor fanatics, not to mention ambitious amateur chefs in the comfort of their own kitchens, too. In addition to the 136 most important edible plants, over 300 species are listed in this book and depicted in more than 360 Leica-quality color images. Moreover, the plants’ botanical characteristics are described to avoid any mix-ups with inedible (or poisonous) relatives. Where, how and when to collect the plants is explained and presented in a table to make them easier to find in nature and this eBook. Extensive information on the ingredients and the nutritional and homeopathic effects of each plant complement over 600 stomach-filling recipes (emergency rations) for hungry outdoor enthusiasts, while ambitious amateur chefs will find more than one hundred sometimes age-old gourmet recipes to try out at home ('Meals with history'). And as the book also includes amusing anecdotes and stories about the myths and folklore behind every single plant, the 600-page eBook also makes for a fascinating read in its own right.